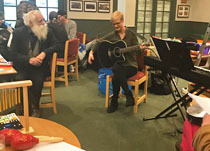 New volunteer Niamh is now offering music sessions, with a variety of instruments, from 1-2 every Monday. They are proving a great hit and the instruments range from keyboard, guitar and flute to drums, maracas, castanets, xylophones and tubular bells. The TAO AGM on June 1st was well attended and included a lively discussion about who is eligible to come to TAO drop-in days and heard about the continuing success of the Kew pop-up shop, which is helping transform TAO's funding. The church selected TAO as one of their two recipients of their Lentern Alms fundraising. Activities included a tea party, sale of books etc and a very successful Argentinian BBQ. Especial thanks to the church for the amazing £5,500 donation and to Chris (on the left) and Mary (3rd from right), both members of the church and TAO volunteers. 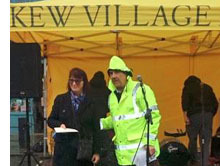 The not for profit Kew Village Market has made a very welcome donation of £1,000 to TAO for music therapy. We are also very grateful to the people of Kew for their generous donations to our pop-up shop there. 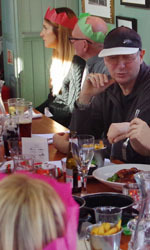 TAO's Christmas lunch was held at Brouge in Twickenham. Over 40 people were there and it was a very jolly affair. 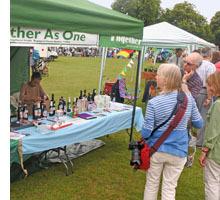 TAO ran a tombola stand at the St Margarets Fair, organised by Carol and raising close to £1,000. 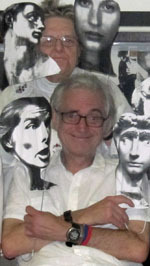 Rick and Lou were there all day too, assisted by Patsy, Daphne, Mary, Susan, Richard and Chris. TAO had another successful year, with a lot of activities and trips and continuing financial viability. 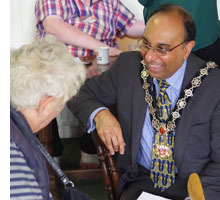 The Deputy Mayor of Richmond, Benedict Dias, gave a short speech congratulating the charity on what it had achieved and Sir Vince Cable, patron of the charity, gave a short speech which you can view here. TAO had a stand at the Kew Fair, raising close to £600. 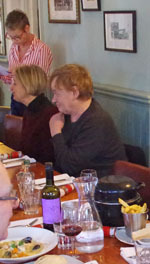 Chris organised the event and was ably assisted by Carol, Lesley, Lou, Cyrus and Steve. Thanks to everyone who supported us on the day. Gunna achieved a real coup in securing spacious pop-up shop premises just round the corner from Kew Gardens station. The grand opening was on June 1st and the shop is expected to make a major contribution to TAO's running costs. Our stand was organised by Richard, with Elizabeth, David, Linda, Carol and Lou helping. Sandwiches and ice cream were supplied by TAO chef Steve. This lovely fair is unusual in being just for charities and has been run for years by Maureen Payan MBE. TAO put on the first of 4 planned tombolas for 2017. These should bring in some very welcome funds and also increase TAO's presence in the community. Many thanks to Catherine for organising and to helpers Gunna, Elizabeth, David, Carol and Lou. And of course to Liz Carron who has organised the Richmond Fair for many years and does such a great job! She is pictured here with David as she was one of our winners. We are also at the Kew Fair on Saturday 17th June and the St Margarets Fair on Saturday 8th July. 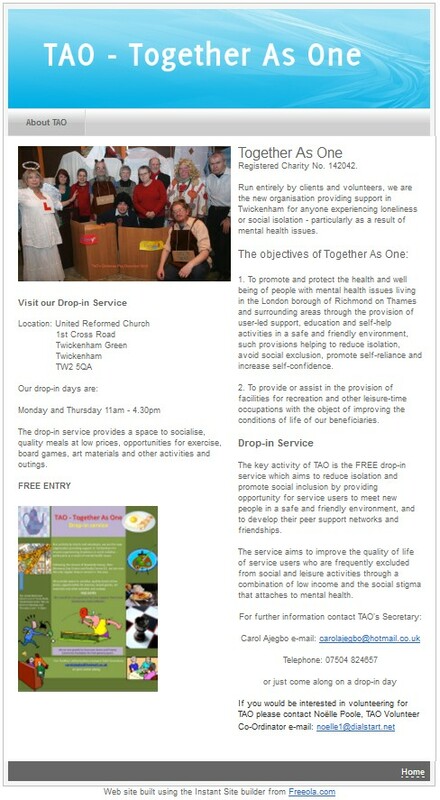 Since before Christmas TAO volunteers have been collecting surplus food from Tesco in Twickenham every Sunday. This is making quite a difference to some of our people subsisting on very little. TAO was at this year's East Twickenham Fair. 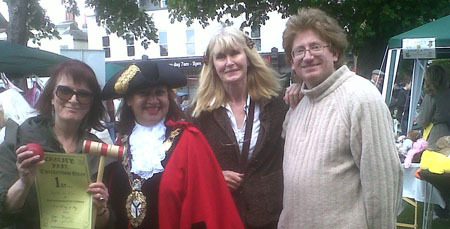 Here volunteers Olga and Cyrus are with the Deputy Mayor of Richmond Cllr Kate Howard. See the gallery page too. 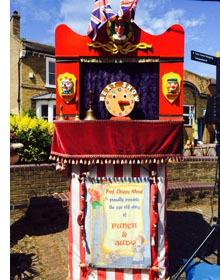 TTBA also put on an excellent Punch and Judy show and al fresco lunch for TAO members. See the gallery page for more photos. There was an excellent attendance at the AGM, held at The Pavilion, Twickenham Green. 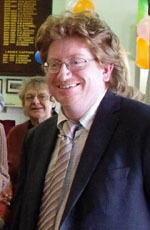 Here is a video clip of the Major of Richmond, Martin Seymour, speaking at the AGM (click or tap to run - it opens in a separate window or tab). 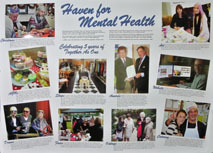 See the Gallery page for some photos at the AGM. 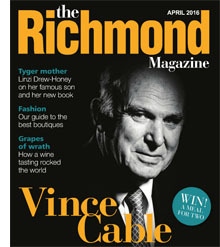 Our patron Sir Vince Cable wrote an article "Life after government" for the April 2016 edition of The Richmond Magazine. Turn to P14 for the article, in which he says "I think TAO is a wonderful initiative ... It's exactly what's needed." The Rugby Football Union has very generously granted TAO £1,000 from their Home Turf Fund for group activities over the coming year, mainly for day trips and art and crafts materials. We'll be cheering on the teams with even more fervour now! The National Physics Laboratory in Teddington has a tradition of making a donation to a local charity when its staff work another million hours without a reportable accident. They have now passed 4 million hours safely and just granted TAO £1,000 from their Corporate Social Responsibility fund. This will be incredibly useful in letting us fund more activities and trips. Gunna found a new pop-up shop premises, at High Street, Whitton TW2 7LB. 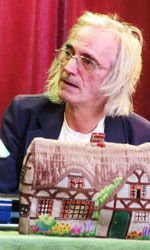 See the pop-up shop page for more photos and information. These shops have been invaluable contributors to TAO financing. 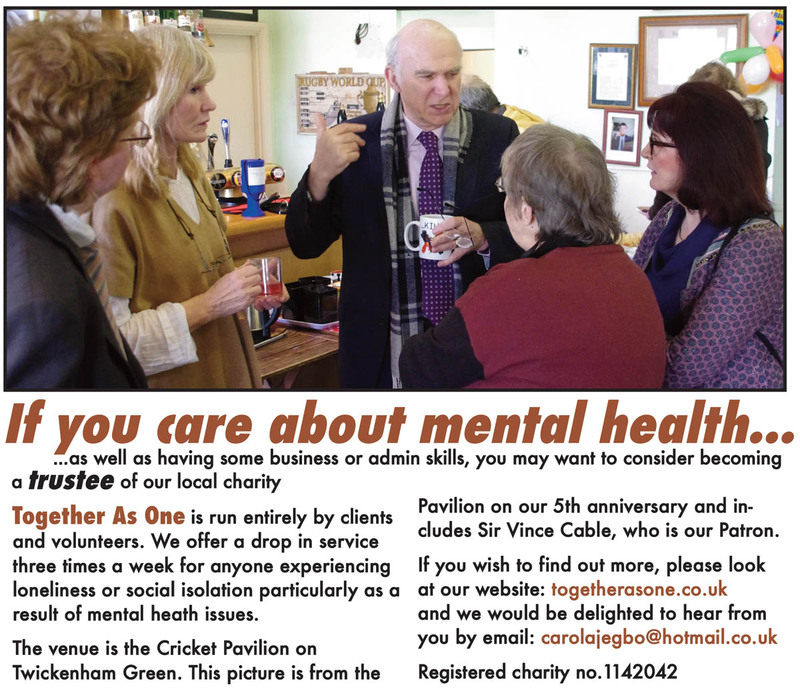 Here is the advert from the Richmond & Twickenham Times, 9th Oct. Click on it (or tap it) to see a larger version. 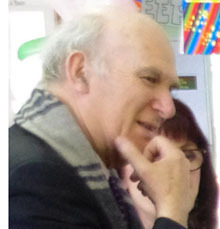 We are thrilled that Dr Vince Cable has agreed to be our Patron. TAO has had a long association with Dr Cable who has supported the group from the beginning so we are extremely pleased to be able to keep this connection. 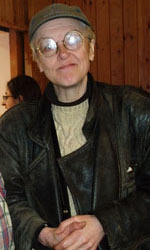 Ann, Membership Secretary on the TAO committee, has moved to Devon to be with her family. We're sad to see Ann go but wish her well. She was recently awarded the Richmond Council Community Award for her invaluable contribution to TAO and she will be sorely missed. The AGM was held in the Pavilion on Twickenham Green. We were joined by the new Mayor of Richmond, Jane Boulton, who gave a lovely and very supportive speech, and by our loyal supporters Councillor Liz Jaeger and Lesley Polesche. TAO's finances were described as healthy, there were nearly 250 service users during the year (helped by going to three drop-in days a week) and all committee members were re-elected. See the Photo Gallery page for more pictures. Click here to see the TAO 2014-15 annual report (it opens in a new tab/window). TAO celebrated it's 5th Birthday in March 2015 and we were thrilled that the Business Secretary, Dr Vince Cable, came along to make it a very special occasion. We celebrated in style with a lovely buffet (thanks to Elizabeth, Steve and Yvonne) and a wonderful birthday cake made by Steve. See the gallery page for more pics and click on the little image to the right to see the celebration poster created by Gunna, Eric and Carol. Dr Cable has supported TAO right from the start which means an awful lot to the group - see the news item in the 2010 archive at the foot of this page. 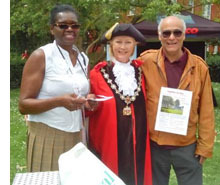 This was a very well attended and jolly occasion, held in the Pavilion on Twickenham Green. 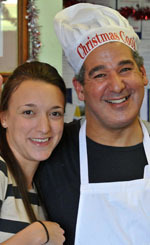 Thanks to everyone who helped make it such a success, particularly the heros in the kitchen. See the Photo Gallery page for more pictures. Ruils is working with Age Uk, Richmond Mencap, EMAG and Richmond Citizen's Advice Bureau under a new consortium called GoLocal. Ruils have been asked to deliver activities and services for individuals who are accessing mental health services or who are living with long term mental health conditions. They have chosen to work with TAO and Taking Control to deliver these activities. Ruils Chief Executive Cathy Maker says "As you know we love what you do. We think that the drop-in and services that you provide really make a difference and we would like to help you to do more." TAO are really excited by this and taster sessions of new activities are now underway on Wednesdays - kindly organised by Debbie Miller of Ruils. 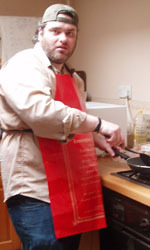 In other respects the additional day is similar in format to the other days with a hot meal provided as usual. At our AGM we were very pleased to welcome the Mayor, Meena Bond, and 3 councillors, David Marlow, Helen Lee-Parsons and Lesley Pollesche - we really appreciate their support. The Mayor said she is a huge supporter of TAO and intends to help us look for a new shop! Our Treasurer reported that attendance had risen steadily and now is between 30 and 50 at each session. The other good news is that due to the shop, donations and fund-raising activities, the group is more financially secure than it ever has been. 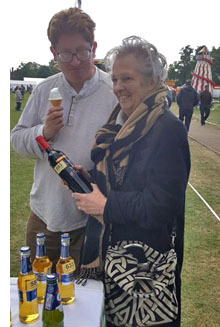 We are particularly grateful to the St Margaret's Fair Committee for their very generous donation. Click here to see the TAO 2013-14 annual report (it opens in a new tab/window). We would like to give a very warm welcome to our new committee member Elizabeth Beilby who is now helping with the day to day running of the group. Elizabeth was a fantastic help in running the TAO shop and it's great to have her now officially part of the team. 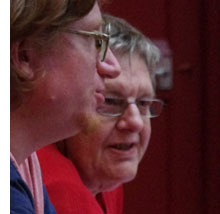 Headed by new director Maggie Hope, TAO's aspiring Pavilion Players actors (Ann, David, Yvonne, Ron, Katherine and Brian) spent 18 weeks in rehearsals exploring themes of humanity with some very interesting results. The Pavilion venue for their play Being Human was completely packed and after a wonderful performance the audience set off happily humming "Golly gee what have you done to me?' See the Photo gallery page for more pictures. There was a very well attended visit to Kew Gardens and we mainly dodged the occasional shower and even hailstorm. 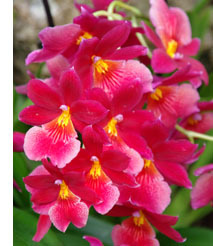 The visit coincided with the annual orchid festival so the group concentrated on the Princess of Wales Conservatory. After an enjoyable time looking at some very colourful displays everyone went to the Orangery for tea and sustenance. See the gallery page for more pictures. 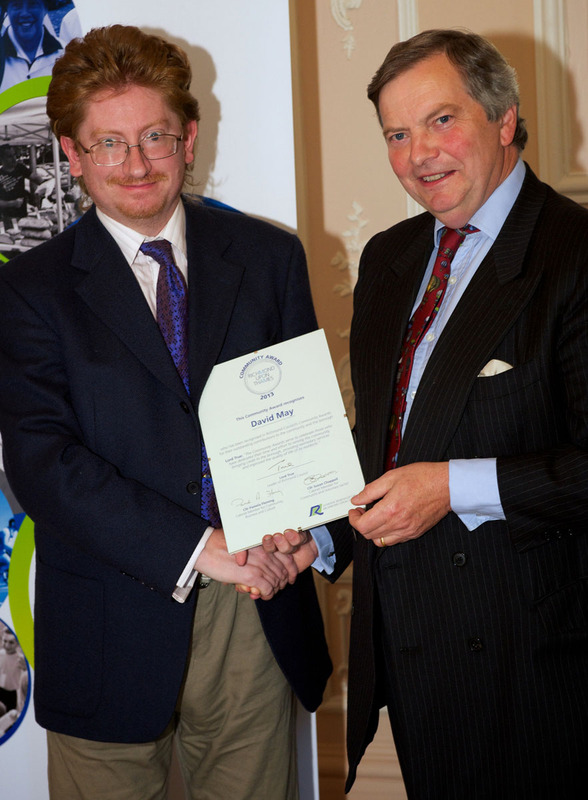 Here he is receiving his award from Lord True (click the image for a bigger version). Richmond Community Awards involved 28 people (from 150 nominations) being given awards. The winners ranged from those who have established and managed community groups, those who organise community events, residents who have volunteered or raised money for charity and those who help support the most vulnerable in society. The new scheme aims to recognise individuals who have brought credit to the borough, given outstanding service to the community, improved the quality of life for local people or benefited the community through community involvement or volunteering. 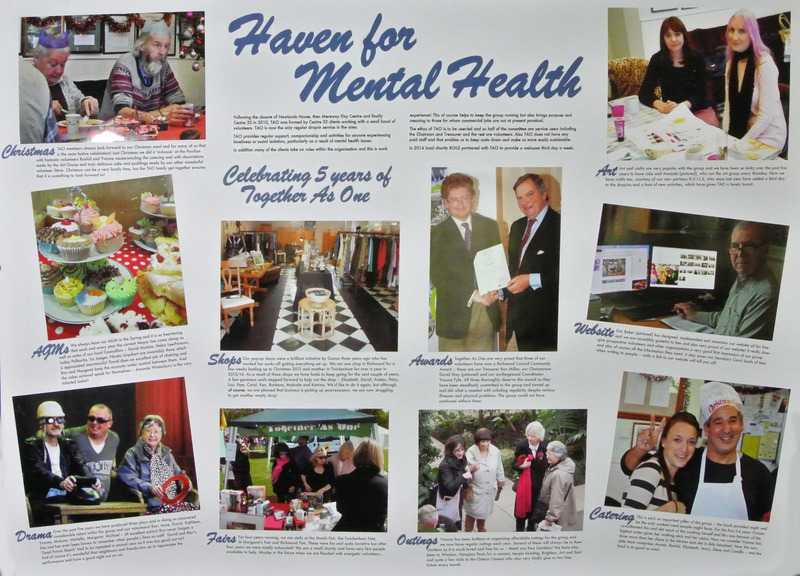 The citation said "David May has been Chairperson of the mental health charity Together as One for the last 3 years, during which he has offered invaluable support to its users and assisted in the successful development of the group." Despite the heat the tombola made £1200 to help fund TAO activities. 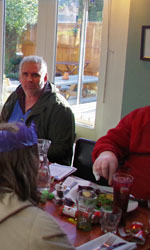 It was organised by Carol, helped by Andrew, Philip, Amanda, Louise, Daphne, Simon, Patsy and Sebastian. Thanks to all the local shops who generously helped us, notably Jardines Estate Agents, Laurels Hairdressers, T Group Fresh Foods, Richmond Bridge Communications, Janes Alanah Hairdressers, Orbit Electrical, The Eye Galleria, Charles Harry Chemist, Armstrongs Butchers, Gaia, Scallywags, Grounded Cafe, Streets Flower Shop, Dexters, Milestones, Fitzgibbon, Townends, Sweet Memories, Sandy's Fishmongers, Pulcinella, Marks and Spencer and The Eye Store. Also many thanks to everyone else who donated prizes. On Bank Holiday Monday, TAO ran a stall at the Hands fair on Twickenham Green. Gunna was ably assisted by her daughter Sunna and by Yvonne Fyffe and David May. They sold bacon sandwiches, teas and coffees which always go down well! Carol and Ken and Kathleen Mulligan ran the Children's Croquet, which won 1st prize for children's entertainment. 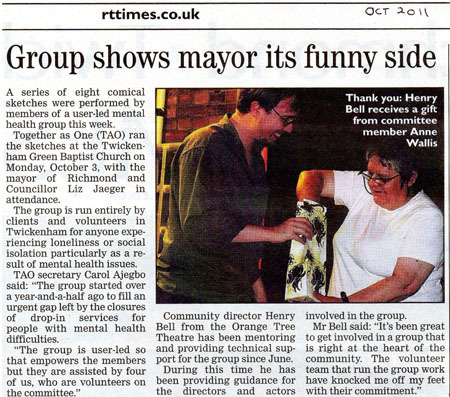 We were delighted that the new Mayor of Richmond, Meena Bond, came by to support TAO. David May (Chair) welcomed the new Mayor of Richmond, Meena Bond. He also gave a special welcome to Councillor Helen Lee-Parsons, Councillor Lesley Pollesche and Aileen Jackson, Mental Health Commissioner from the GP led Clinical Commissioning Group. The well attended AGM heard a review of the year's activities and also heard that the pop up shop had provided a very welcome boost to TAO finances. A clip from the Mayor's address is here. The meeting ended with delicious tea and cakes. Through a stupendous effort our charity shop in the middle of Twickenham has broken all funding records for our charity and that now makes all sorts of things possible. Thanks to everyone who has contributed the material we have sold. But above all we must thank the (totally unpaid) volunteers who have run the shop for the past few months: Gunna (who organised the whole enterprise), David, Malcolm, Avtar, Carol, Pam, Lou, Patsy and Linda. Heroes all! 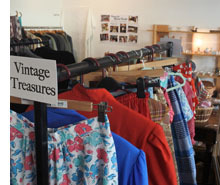 We have opened a pop-up charity shop on Twickenham High Street. With reasonable prices people have been flocking in to buy. This will help make us less dependent on obtaining funds from other sources. But of course we're going to run out of stock unless we keep getting donations. 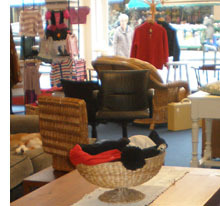 We're selling clothes, handbags, shoes, bric-a-brac, jewellery, children's toys, furniture. We can't sell electrical goods and don't sell books (except children's books) - but just about anything else. We'd be really grateful if you have anything saleable if you could pass it our way. 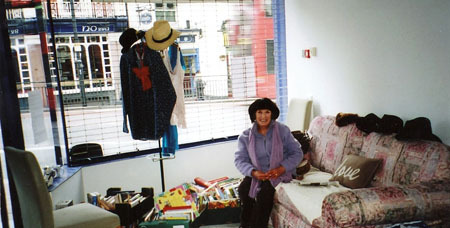 We would also welcome volunteers to help run the shop. 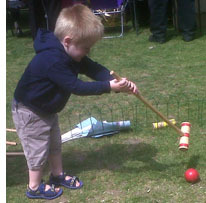 TAO had a stall with tombola, bric a brac, children's lucky dip and children's croquet game. These raised over £1000 for TAO. Thanks to Carol Ajegbo for orgaising it and Patsy Harper, Lou Ajegbo, Anne Wallis, Daphne Williams, Charlie Williams, Kathleen and Ken Mulligan for their help. Also to all the kind shop-keepers and friends who donated tombola gifts or cash to buy gifts with. We sold hot-dogs, tea and coffee and ran croquet and crafts for children. We got 1st prize for children's entertainment. Gunna was the chief organiser, ably assisted by Yvonne, David, Carol, Kathleen & Ken, Bonnie & Angela. Thanks to Hands for organising this fair and to Unearthed for donating their exceptional quality Bavarian Frankfurtars (available via Waitrose or Ocado). The stall made a very useful £370 for TAO. 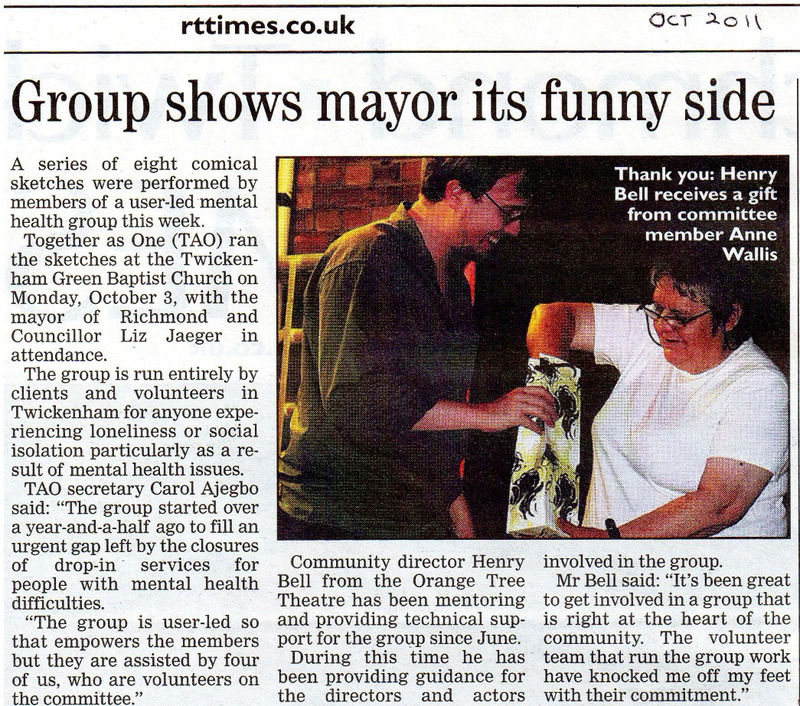 The AGM was held on 14th May at the Twickenham Green Baptist Church. 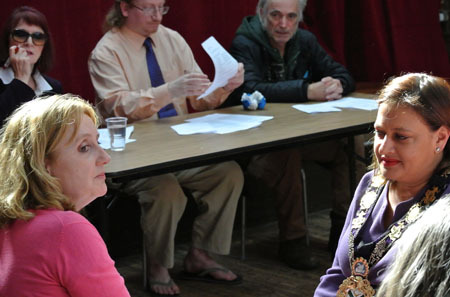 There was an inspiring address by the Mayor of Richmond, Clare Head (see the video at the foot of the Gallery page). The accounts showed that TAO's fund raising efforts had been very encouraging in 2011-12. All committee members standing for re-election were elected unanimously. 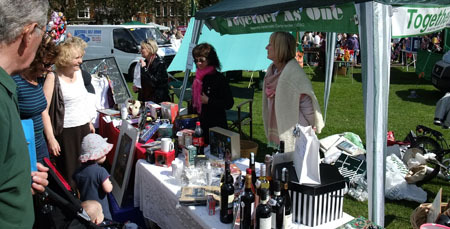 There was a TAO tombola stall at the May Fair on Richmond Green on May 12th and for once the sun shone. The stall made a fantastic profit of £700 for TAO. Thanks to Linda Mekie for organising it and to her helpers, notably Ben, Myra, Bill, Christina and Patsy. 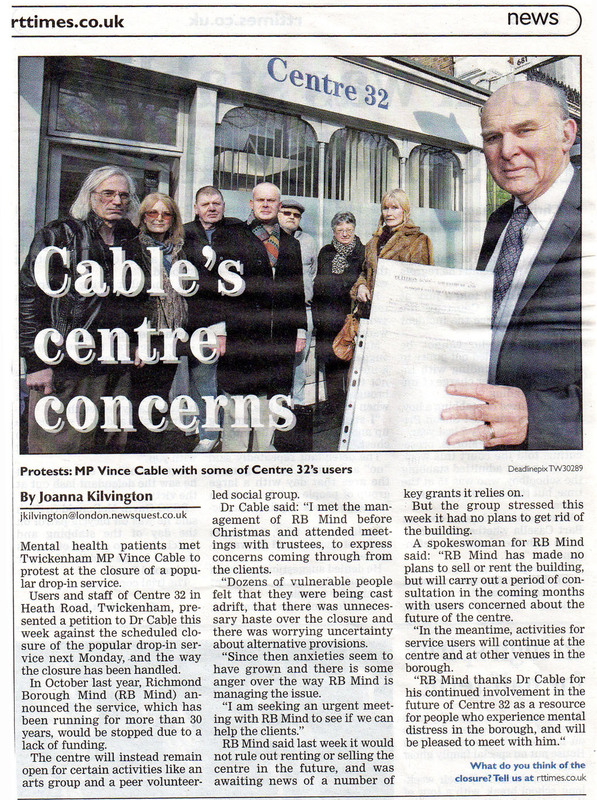 The drop-in centre went live on the web with a broadband connection in May. Organised by Carol Ajegbo and using a reconditioned laptop supplied by Robin Judd this allows users at the drop-in centre to access websites, email etc. State benefits levels are far too low to allow for private broadband connections. Following a lot of research by our Secretary, Carol, we now link to our page on The Big Give website for online donations - that means we get most of each donation (even more with Gift Aid) and have no fixed payments to make for the service. A new Support us page was added to our website, allowing online donations to be made from credit or debit cards. There is also a new online Gift Aid declaration form to support regular donations via standing order. 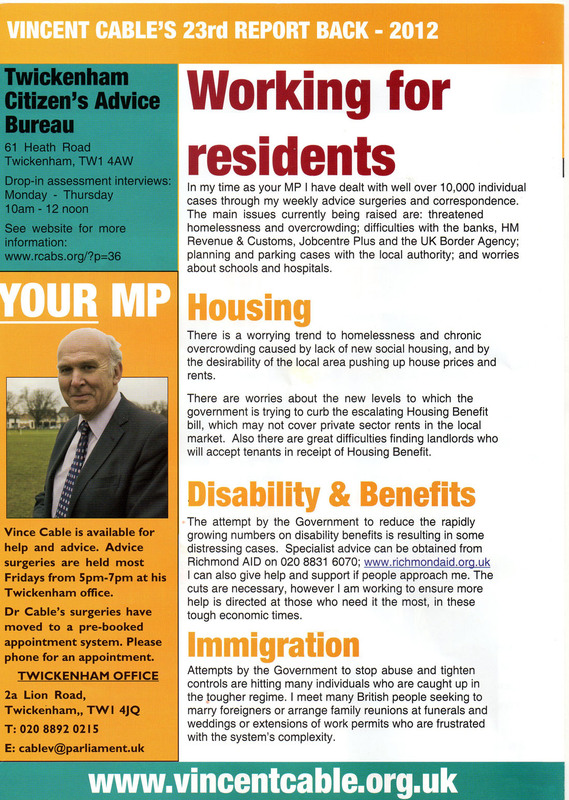 Click on the thumbnail to see Vince Cable's item on disability benefits. He said "I am working to ensure more help is directed at those who need it the most..."
Waitrose in Richmond chose TAO as one of their three charities for Jan 2012. The way it works is shoppers there can get green tokens with which they vote for one of the the three charites of the month. Waitrose then shares out a donation, proportional to the 'votes' cast. TAO received £260 - very useful; thank you to Waitrose and everyone who pushed their green tokens our way. 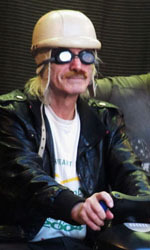 The site you're looking at was first published on 10 Jan. It replaced the old one page site (many thanks to Robert Poole for getting us off the ground with this). Eric Baker, who did the new new site for us, showed it to users and volunteers in late Jan and at their suggestion added a Committee page plus some new photos. Our very first pop-up shop was open for 4 weeks from Saturday the 12th November. A grant of £1,000 was received gratefully from the Thames Community Foundation for start up costs and an empty shop was found near Richmond Station which was a wonderful location of course! In a new cooperative partnership with the Richmond Furniture Scheme, the shop offered good second hand furniture; we also offered good quality second hand clothing, games, bric-a brac, jewellry and anything and everything that we could get our hands on. While the shop was open members of the public brought their contributions to replenish our stock! This project was a huge success and most of the proceeds have been transferred to the TAO rent account. Many thanks to all the volunteers who helped to run the shop. TAO hope to run a similar project in the near future and will of course be looking for volunteers! The commitment is generally 11am – 4.30pm for each day. 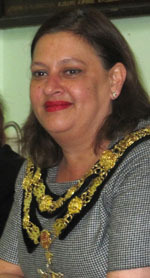 The AGM was held on 12 May, with the Mayor of Richmond in attendance.